Photos by Roger Meyer (RM), Terry Carr (TC), Jack MacDonald (JMacD), Chris McVittie (CMcV), Brian Avent (BA), David Hoar (DH), Glen Bodie (GB). More photos at our DNCB Flickr site. By daybreak the snow had abated, but the roads were icy and it took 20 minutes to clear the car windows. However, the main roads were clear and the sky cloudless and despite a –4 degree temperature, 7 birders, Mike, Terry, Glen, Chris, Roger (me), David and Noreen, appeared at Petra’s prepared to face the elements. We departed at 7:30 am for 104th Street and the Delta Heritage Air Park where we were joined at 8:00 by three other hardy members, Brian, Jack and Nance (who arrived an hour later after getting lost in the wilds of Surrey). There, we were treated to a beautiful sunrise and a panoramic view of the freshly snow-capped mountains. From the top of the dyke we could see large numbers of ducks away out on the water but the light was not good for viewing. Later we could see better and determined that most of the ducks were Northern Pintail and American Wigeon (we were not able to detect any Eurasian). On the mudflat were groups of shorebirds which we later determined to be predominantly Black-bellied Plover and Dunlin. Walking west along the dyke we saw more of the same shorebirds with a few Long-billed Dowitchers and Greater Yellowlegs (only two). Birds of prey were scarce except for Bald Eagles, of which we saw at least 50! There were only two Northern Harriers seen, one male and one female. At one point Noreen requested a Short-eared Owl and within minutes one appeared flying over the incoming tide line… this was the bird high-light of the day! We followed the dyke as far as the Mansion and the only excitement there was the formation flying of the thousands of Dunlin as they were spooked by Eagles flying overhead… always a great sight! We did see a large flock of Trumpeter Swans in one of the farm fields but the small birds were mainly White-crowned Sparrows, Song Sparrows, House Finches, and a few Spotted Towhees. Also seen, as expected, were lots of American Robins, Northwestern Crows and Eurasian Collared Doves and a number of Great Blue Herons. At one point we made an effort to sort out the gulls and identified some Ring-billed, Mew and lots of Glaucous-winged. The two pet goats were present, as usual, at the house at the beginning of 104th. So, not so great as far as the number of species seen, but we were happy with the beautiful day and were glad we made the effort to get out of our warm beds to go out into the cold and dark. Terry, Mike and I stopped along 72nd at the turf farm, but the Slaty-backed Gull was not to be seen. 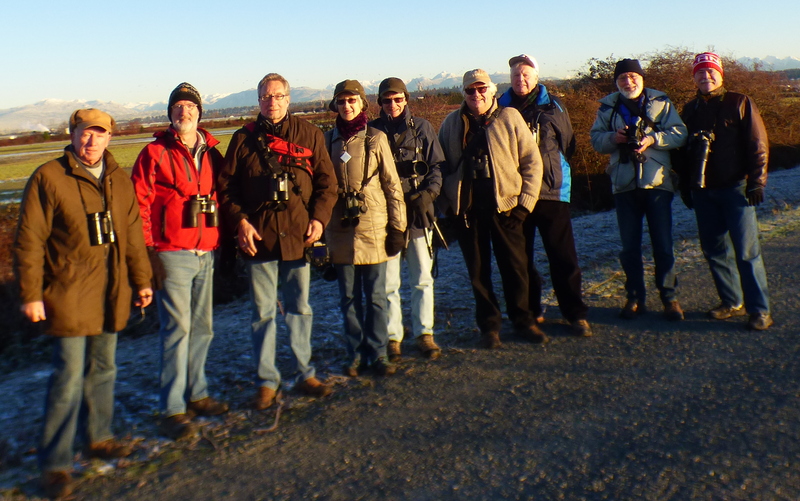 Next week, on Wednesday December 14 is our quarterly Birds-on-the-Bay Outing. We will meet at 9 am at Cammidge House. See BOTB Poster. We look forward to Tom’s return and hope he is able to adjust to the extreme temperature change! 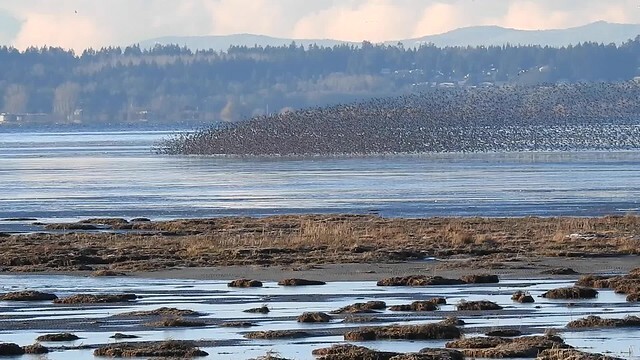 This entry was posted in 104 Street, Bald Eagle, Black-bellied Plover, Boundary Bay, Dunlin, Long-billed Dowitcher, Mew Gull, Northern Harrier, Short-eared Owl, Trumpeter Swan. Bookmark the permalink.